My two favourites meals would be breakfast and ‘teatime’! As kids, tea time meant hot chocolate milk with biscuits or a snack. I always looked forward to the biscuit part! 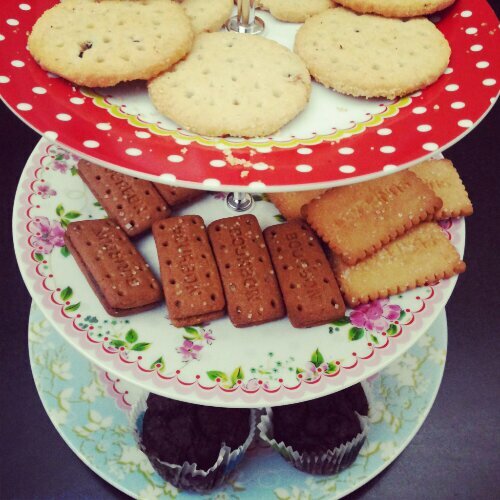 My favourites were and still are – Bourbon chocolate biscuits and Nice, sugar coated coconut biscuits. I always enjoyed India’s classic biscuit- Parle-G. When I was studying in California, I would try to find them at the nearest Indian store and dip them in some deliciously spiced, milky Indian tea! I still enjoy my biscuits dipped in my milky tea. While I prefer herbal teas, if there are biscuits and if I’m at home, I’m going to get good ol’ Indian sweet,spiced milky tea to dip my biscuits. You definitely enjoy this type of tea on a rainy and slightly cold afternoon. I love the versatility of the food you can serve with tea. They’re easy to eat, finger foods that aren’t heavily spiced. They’re fun to make and you can have interesting shapes. I was having a few friends over yesterday and I decided to get some biscuits, bake cupcakes with a rich chocolate frosting, make a hung curd dip to serve with herbed pita chips and make my shortcut bruschetta! I had so much fun making everything in bite sized portions and was happy to see that they enjoyed it. 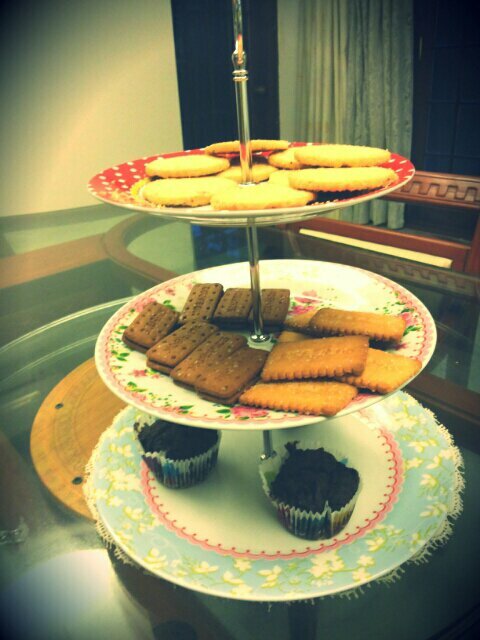 What I enjoyed the most was using a cake stand that S and I got as a wedding gift from my cousin! The plates were Victorian era influenced and u loved the way it all came together. I decided to make it the ‘sweet station’. I put all the biscuits and cupcakes on the stand and made it my center piece. Girls love sugar even if they are publicly obliged to hate it because of all the calories! We totally enjoyed our sugar and had a wonderful evening sipping our teas and coffees amidst the sound of raindrops.